ALICE (Asset Limited, Income Constrained Employed) lives in every community. In the East Michigan Council of Governments (EMCOG) 1 out of every 2.2 households (45%) are earning less than what is needed (the ALICE Threshold) to afford the basics, such as housing, child care, food, transportation, health care and technology. The numbers vary by county from a low in Midland County of 34% to a high in Clare County of 55%. The number of households within the EMCOG Region not earning enough to afford the basics has increased since the 2017 report (1 out of every 2.4 households or 42% as reported in 2017). Statewide the number of households as reported in the 2019 report, amounts to 43% with income below the ALICE Threshold. The 2019 Michigan Report “ALICE In Michigan: A Financial Hardship Study” was released in March of 2019. It is the third report produced by the Michigan Association of United Ways. The first report was released in 2015, and an update was released in 2017. The following are quotes from the executive summaries of each of the three reports which briefly summarize the findings and trends in quantifying how Michigan households are doing. The report includes analyses from each of the 3 reports (2015, 2017 and 2019). The summary includes links to the Michigan Report. Please Contact Jane Fitzpatrick at jfitzpatrick@emcog.org for further information on the EMCOG prepared regional reports. EMCOG consists of Arenac, Bay, Clare, Gladwin, Gratiot, Huron, Iosco, Isabella, Midland, Ogemaw, Roscommon, Saginaw, Sanilac and Tuscola counties. All county or municipal governments (city, village, township), downtown development authorities and economic development authorities, nonprofits, educational institutions, adult education agencies, workforce development agencies in the East Central Michigan Prosperity Region 5. EMCOG is required to submit an annual assessment of the Comprehensive Economic Development Strategy (the CEDS) by January 31 of each year. Included in this annual assessment is an updated Appendix B, Implementation Matrix which includes progress for each action item that was scheduled to be initiated during the reporting year. The 8-County East Central Michigan Prosperity Region 5 maintains a dashboard that measures progress/changes in several measurable metrics to monitor movement/dynamics relating to the goals, objectives and actions within the regional strategy. The metrics were determined by the PR-5 Strategic Management Team (the Collaborative) during the development of the strategy in 2014. The following is a summary of the dashboard based on the most recent update that was completed for the third quarter of 2018. Eighteen projects out of 42 applications will receive a boost in funding thanks to the East Central Michigan Prosperity Region 5 Mini and Micro Grant awards announced this week from the East Michigan Council of Governments (EMCOG). This is the second year of the EMCOG grant program which is funded by Michigan’s Regional Prosperity Initiative (RPI). EMCOG is distributing $132,000 to projects that support various economic development, workforce development, transportation, educational, outdoor recreation/tourism and place-making initiatives throughout the 8 county Prosperity Region 5. In total, 42 applicants applied for funding. The second annual East Central Michigan Prosperity Region 5 Grant Program is being led by the East Michigan Council of Governments (EMCOG). This project is being funded by the State of Michigan as part of the state’s Regional Prosperity Initiative. Selected Federal Agency Announcements and Related for the Week of February 5th, 2018 - The following is a selection of recent announcements gleaned from various federal sources and colleagues, and is provided to EDA's Economic Development Integrators to increase our awareness of complementary resources for economic development. Eight projects will receive a boost in funding thanks to the East Central Michigan Prosperity Region 5 Mini Grants awards announced this week from the East Michigan Council of Governments (EMCOG). The first time mini-grants, funded by Michigan’s Regional Prosperity Initiative (RPI) will distribute $100,000 to projects that will support various economic development, transportation, educational, outdoor recreation/tourism and place-making initiatives throughout the 8 county region. In total, 14 projects competed for this first round of funding. The findings of the study reveal a region facing important challenges. Perhaps the most productive role for the report is to provide a benchmark of the current status of the region’s labor force and potential labor force – to be used by stakeholders to identify areas where economic developers would like to encourage growth and development; to aid economic developers as they leverage the regions resources; and to facilitate conversations aimed at identifying key strategies to positively impact the region’s economy and move it forward in a positive and sustainable way. Michigan's Office of the Great Lakes, along with several other state agencies, has authored a long-awaited comprehensive water strategy document. 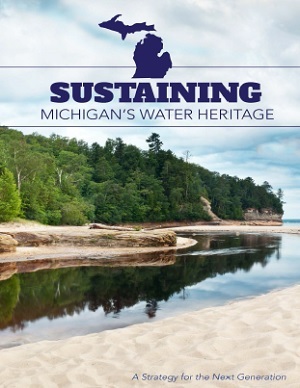 Michigan’s Water Strategy will, for the first time in our state’s history, outline a vision for the future for managing, protecting and enhancing one of our greatest natural assets: abundant freshwater resources.